"I hope that children and their families become increasingly attentive to what matters most to them. I also want them to learn the backstory of the 'stuff' we buy and use. With new knowledge, I want them to make their communities healthier, better places to live." Susan Salterberg was interviewed by New Dream. Find out why she started teaching courses for educators, what kind of change she hopes to see in the world, and discover some of the biggest takeaways educators experience by working with Susan. A few tips from Reclaim Your Holidays are highlighted in this piece! Kathleen Morrison, a technology teacher, worked with grades 3-6 at St. Patrick's in Anamosa, and her students researched milk and milk waste. 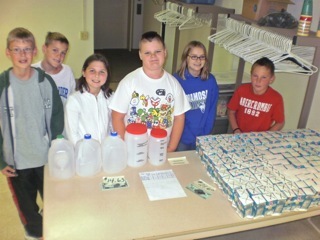 "After our week long collection, the fifth graders figured the cost of wasted milk at lunch. They made a display and set it up in the lunch room to show the number of cartons of milk they collected, weight of the trash, the money spent on milk that was poured down the drain (in gallons and per cartons). I have pictures I displayed in the hall at school and also sent the information to the local paper, which was published. Even our head cook was amazed at the results." Teachers Emily Stensland and Liz Foelske involved 6th-8th graders in cross-curricular activities for a unit that explored decisions about material possessions. “Of the many activities, we explored – really pored over – was the Material World resource," shared Stensland citing Peter Menzel's book, a collection of photographs that comment on the material possessions of families around the world. "Students could not get enough time with the books and found that they really wanted to read about the pictures." 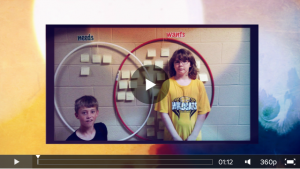 The class made a Venn diagram sorting needs and wants and presented supporting arguments for their decisions, pictured above. Students also observed Material World photographs, comparing and contrasting the differences between countries through a writing exercise. The unit brought together all of the core teachers who work with the students, the principal, the lunch helpers, the bus drivers, the custodians, and even the superintendent as participants. Copies of Material World: A Global Family Portrait are available from several Area Education Agencies and local libraries. Students at South O’Brien Elementary collect shoes each year for Soles4Souls, a micro-enterprise project. 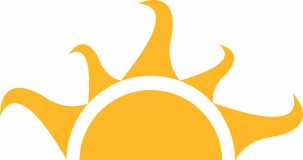 Soles4Souls creates sustainable jobs for people in impoverished countries by sending donated shoes to the owners of these small businesses who then sell them. “We did another shoe drive this year and collected an estimated 650 pairs of shoes!” said Rebecca Miller who heads up the collection. In 2014, the sixth grade class won the all-elementary school competition by collecting 92 pairs of shoes. The third grade class delivered the shoes and toured the Soles4Souls processing center in Sheldon, Iowa. The center is located at Village Northwest Unlimited, employing people with disabilities who help sort the shoes. 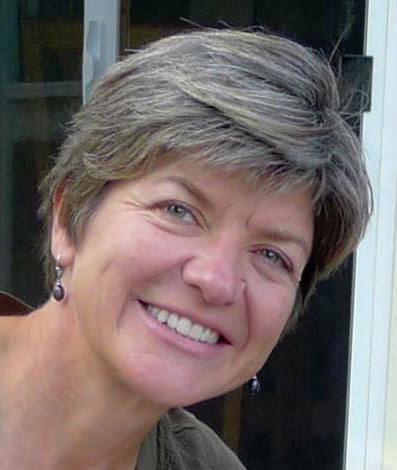 Susan is passionate about creating a better world for present and future generations. She has more than 35 years of combined experience in communications and environmental education work. Susan envisions a world filled with people who are focused on relationships, service, and experiences - not on "stuff."